A book showcasing the projects of Japanese architecture firm Suppose Design Office, founded by Makoto Tanijiri and Ai Yoshida. This is the first collection of works from the viewpoint of multiplicity and the design thinking of the creative team at Suppose Design Office, who are always seeking for something new. Based on an architectural perspective, the firm defines its work as discovering fresh ideas, new styles of buildings and new relationships between all interactive elements. They have designed workspaces, landscapes, products, art installations and more than 100 houses. Their interest in the problem-solving and creative challenges of architecture extends through all scales and budgets from ‘doghouses to skyscrapers’. Both the new and the familiar inform their search for fresh solutions to the issues of everyday life, which is explained in this book. This monograph offers an exclusive peek into the working life of a world-renowned design firm. By explaining the design processes for creating interior architecture, it is a vital book for anyone in the design industry, from interior designer to manufacturer, and from architect to space designer, as well as students, agencies and professionals in the whole design sector. Makoto Tanijiri is one of the founding architects of Suppose Design Office. He is also a professor at Musashino Art University, Osaka University of Arts and Anabuki Design College. Ai Yoshida is one of the founding architects of Suppose Design Office. Readers gain complete insight in the working methods of the architectural firm Suppose Design Office. In-depth features of the different design projects realised by the firm’s founders Makoto Tanijiri and Ai Yoshida their team. 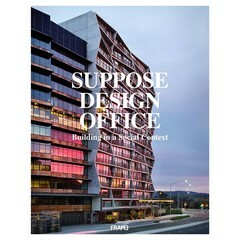 This is the first ever book about the work of Suppose Design Office and gives an in-depth look at the design processes. Tanijiri and Yoshida define their work as a chance to realise fresh ideas about buildings and the relationships of all interactive elements.